← Take the Little eLit October Challenge! I’m back with more about Music Together from a children’s librarian’s perspective! A quick recap about me: I’m a youth services librarian in a small rural library. I attended a Music Together Teacher Training in May to improve my mixed age storytimes for children age 0-3. I wrote about the experience in two posts here on Little eLit. Hello, Everybody! Based on Music Together’s Hello Song; illustrated by David Hill. She Sells Sea Shells; illustrated by Bruno Merz. One Little Owl; illustrated by Nancy Meyers. If you’d like to get a taste of what the storybooks look like or some extra tips on how you might use them, I recommend watching the “Using Your Singalong Storybook Musically” video. It models some great interactive reading practices, and I love that the families they feature don’t sound like professionally trained singers. You can also listen to the songs for free via the same page. I’d originally planned to review each book individually, but I realized that the majority of my comments were the same for all three books. Instead, I’ll break my review down by three criteria: Illustrations and Design, Parent Information, and Usability. One of the first things I noticed about the illustrations is that they suit the style of the songs. Hello, Everybody! has cheerful, colorful, cartoon-style illustrations that fit the welcoming and fun tone of the song. She Sells Sea Shells, which is a dreamy kind of song, has pencil and watercolor illustrations in more muted tones that suit the subject matter. I was surprised by the illustrations in One Little Owl, however. While the lyrics are silly, I tend to think of it as a spooky song because the music is written in a minor key. The illustrations capitalize on the silliness, which works well, but definitely startled me at first. Music Together sent me both hardcover and board book versions of the three titles. I was a little apprehensive about the board books, as adapting a picture book to a board book can be a challenge. Each page, thankfully, has a limited amount of text in both formats, creating a good balance between text and illustration. While the illustrations look a little pinched at the top of the board book pages, all the important elements are there. While I wouldn’t use the board books in a storytime setting, they’d be great for one-on-one sharing with babies and toddlers who need sturdy pages to turn. All three books provide plenty of information for parents. Each book has 7 sections geared towards parents: Welcome, Using the Book, About Music Together, About the Song, Activities, Sheet Music, and Getting the Music. The Using the Book section is a good introduction to the Singalong Storybooks for all parents, including those who might never have heard of Music Together before. The Activities sections are excellent and give parents a great starting point for practicing dialogic and interactive reading strategies with their children! While all of the information is potentially useful to parents and caregivers, there is a lot of front matter between the title page and the first page of the story. The Welcome! and Using the Book sections are great for first-time readers, but the About Music Together and About the Song sections would be more appropriate in the end matter. That information isn’t necessary to using the book; most readers will flip right past it impatiently to get to the start of the story. 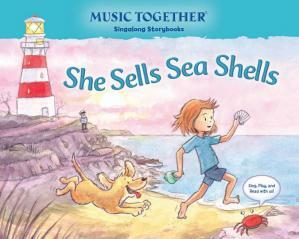 Of the three books, I think that One Little Owl and She Sells Sea Shells are the most versatile because the text in the books matches the lyrics sung in the recording. Parents reading one-on-one and librarians leading a storytime have the option to read the book aloud, sing the book a capella, play the recording, or sing with the recording. This is especially valuable in a one-on-one setting with parents who haven’t heard the songs before. They can listen while they share, which can be especially valuable for shy singers. The text in Hello, Everybody! doesn’t match the song lyrics on the recording. While the book does a great job of illustrating some fun ways to adapt the song, it can’t be used in tandem with the recording the way the other two books can. 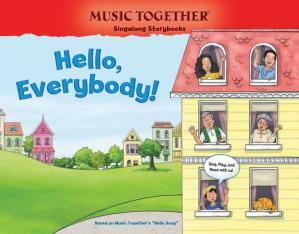 This is no problem for Music Together families who know the “Hello Song” inside and out, but I imagine that readers without that experience would find the book a little confusing at first. I’m planning to test out One Little Owl and She Sells Sea Shells in my storytimes to see how these work in a storytime with shy singers. Unfortunately, I think I’ll have to wait a few months to try these because my library arranges its storytime themes around letters of the alphabet. We won’t reach O and S until later in the year! With engaging illustrations and a great selection of parent tips, the Music Together Singalong Songbooks are a fun way to combine music and early literacy. 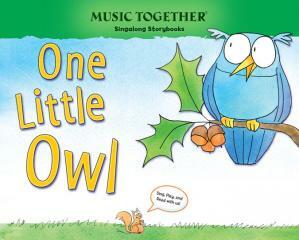 One Little Owl and She Sells Sea Shells are great for sharing in any setting: one-on-one or group, sung by the reader or listened to on the recording, with families new to or familar with Music Together songs. While Hello, Everybody! is great for singing along either one-on-one or in a group, it lacks a recording for listening along, making it more challenging for non-Music Together families to use. Barratt Miller is the Youth & Adult Services Librarian at the Crook County Library in Prineville, Oregon. She received her MSLIS from the University of Illinois at Urbana-Champaign in 2012. As a graduate reference assistant at the University of Illinois Library, she selected materials for the School Collection, the second largest collection of children’s literature in North America. She also reviews middle grade and young adult science fiction and fantasy novels for The Horn Book Guide. Posted on October 3, 2013, in Music Together and tagged Barratt Miller. Bookmark the permalink. Leave a comment.